A look at some of the common gardening jobs that need to be carried out in July. Beans: Sow from Mid July to Mid August. Harvest in around 55 days time. Broccoli: Sow from Mid July to Mid August. Harvest in around 60 to 70 days time. Cabbage: Sow from Early July to Mid August. Harvest in around 60 to 75 days time. Chinese Cabbage: Sow throughout July. Harvest in around 40 to 50 days time. Cauliflower: Sow from Mid July to Mid August. Harvest in around 55 to 65 days time. Collards: Sow throughout July and August. Harvest in around 65 to 70 days time. Cucumber: Sow throughout July. Harvest in around 50 to 55 days time. Kale: Sow throughout July and August. Harvest in around 55 to 65 days time. Kohlrabi: Sow from Mid July and throughout August. Harvest in around 40 to 50 days time. Lettuce: Sow from Early July through to Mid September. Harvest in around 40 to 50 days time. Mustard: Sow throughout July and August. Harvest in around 35 to 45 days time. Potatoes: Sow throughout July. Harvest in around 90 to 120 days time. 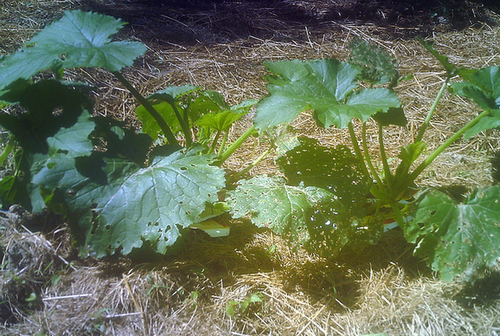 Summer Squash: Sow from Mid July to Mid August. Harvest in around 40 to 50 days time. Tomatoes: Sow throughout July. Harvest in around 70 to 80 days time. Time to sow the Summer Squash. Photograph by Gibby's Garden. Carry on sowing seeds of salad and herb plants for continued harvests. Harvest seed from foxgloves and sow into pots. Harvest Rhubarb, Potatoes and Shallots when they are ready. Harvest Gooseberries towards the end of the month when they become ripe. Pick, use and dry herbs. If you have Brassica species growing then now is a good time to transplant them from your seedbed to their final position. Once transplanted protect them with cardboard or carpet collars; this will help to protect them from cabbage root fly. Also cover with netting to prevent them being eaten by cabbage white butterflies. If you see any butterfly eggs rub them off using your fingers. Once Leeks are about the thickness of a pencil they should be transplanted from their seedbed. If you are planning on sowing swede (Swedish turnip) this month it is a good idea to cover the seeds with fleece to protect them from flea beetles. Lots of watering to be done at this time of year. Hedges should be trimmed regularly. The Lawn may require edging, regular mowing is also necessary. If you do not have one it is a good time of year to create a water feature. Deadhead Roses, Delphiniums and Lupins to encourage further blooming. Once philadelphus have finished flowering remove stems carrying old flowers by pruning. Also prepare the plant by removing the oldest wood and stems that are weak. Prune back long side-shoots of Wisteria down to about eight inches in length. Bulbils can be removed from lilies and potted. 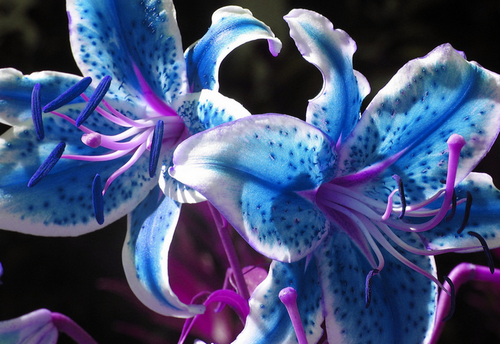 Blue Stargazer Lily by pixydust8605. Control the growth of Ceanothus, Weigela, Escallonia and Kerria by cutting them back. Be sure to spray your roses regularly to help prevent diseases. Also spray apple and pear trees to protect them from mildew. Thin apple and pears that have heavy crops. If you have Flag / Iris then it is time to divide them. Lift them out, divide and replant into fresh soil. Rhododendrons will require an application of acidic fertilizer such as Miracid or Sequestrene. Onions can be fertilized by mixing it in with a hoe while weeding between rows. Hanging baskets and pots will require a weekly dose of fertilizer. If you have not done so already cover fruit bushes with netting to protect them from birds. Once the Rhubarb harvest has finished cut back flower spikes to the base of the plant. Potatoes and Tomatoes that are being grown outdoors should be sprayed to prevent infection by blight. 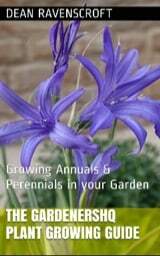 Its a good time of year to order bulbs for autumn planting. Encourage tomatoes to grow tall by removing side-shoots from the main stem. Water them regularly and give them a weekly dose of high potash fertilizer. Harvest Tomato and pepper fruits. This will encourage further flowering. Ensure plants that are in pots grow bags get a weekly feed. It may be getting very hot at this time of year so ensure that there is an adequate flow of air through the greenhouse through your vents, add more if necessary. Pelargoniums can be propagated from cuttings. Be on the look out for pests such as weevils, control if necessary. Control whitefly by the use of hang up sticky traps. Avoid scorching of plants growing in a windowsill by moving them to a place which is less heat intense; or provide them with shade by placing behind a net curtain.